Hot swap bays are awesome. 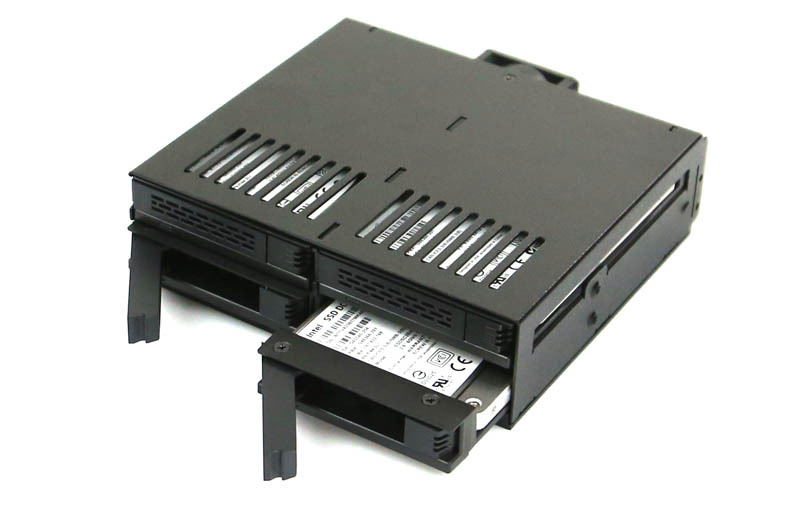 They allow one to quickly swap drives in the event of a failure and can decrease the need for extensive cabling. 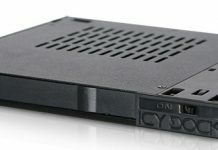 The Icy Dock ExpressCage MB324SP-B we are reviewing today is an evolution in the company’s designs and a great piece of innovation. Simply put, this is one of the easiest hot swap bays we have ever used, even after reviewing them for almost six years now. The tool-less ExpressCage design was very simple to use. Looking at the Icy Dock ExpressCage MB324SP-B we see a fairly standard design. There are four hot swap bays in a 2-by-2 configuration. 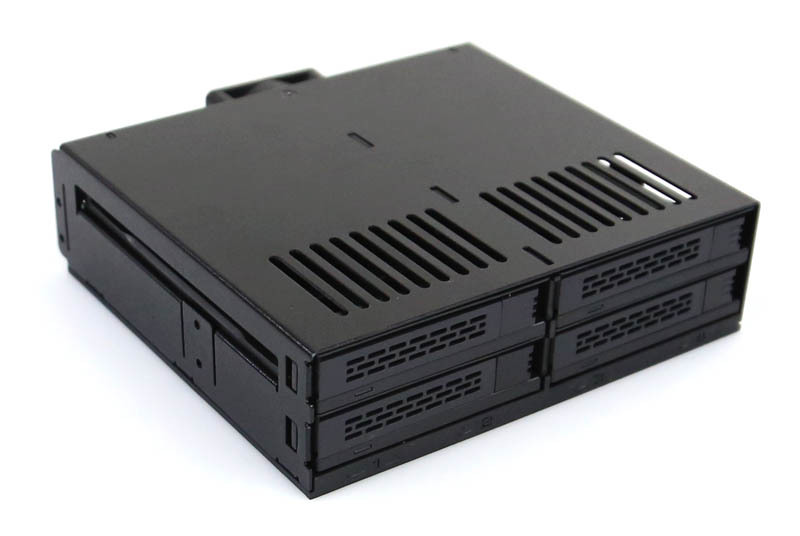 This allows for four 2.5″ drives to be installed in a 5.25″ drive bay. One can see the ventilation all around the enclosure which helps keep the drives cool. There are LED activity lights as we would expect from a hot swap unit. Moving to the rear of the unit we see a fan which helps circulate air though the enclosure. There are three speed settings via jumper on the fight rear panel: high, low and auto. It would have been nice to have a “no” or “off” option as there are many SSDs that do not need a fan in a well ventilated cage. 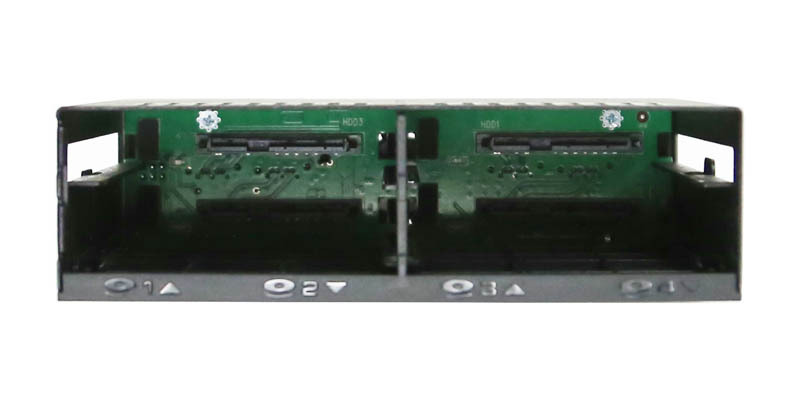 In terms of inputs there are four 7-pin SAS/ SATA data connectors, one for each drive bay. 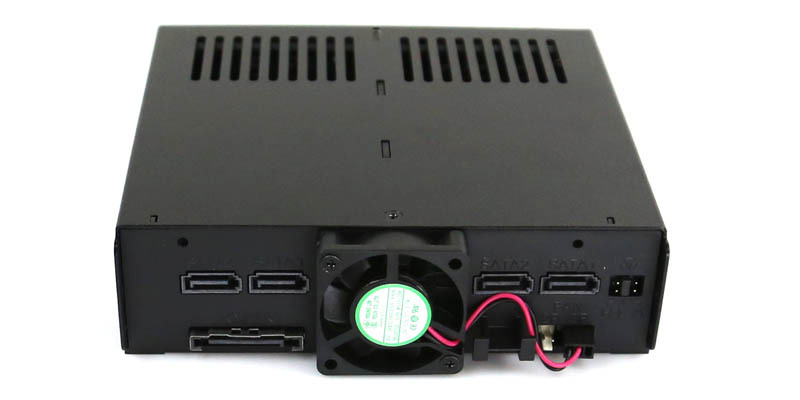 The SATA style power connector provides power for all four drives as well as the fan. Inside the chassis we can see the PCB that carries power and data signals to each drive. Unlike some competitive solutions, these connectors are single port SAS capable as well as handling SATA connectors. This is a welcome feature since there are some low cost hot swap bays that can only accept SATA drives. ExpressCage is a game-changer. Installation of the Intel DC S3700 SSD pictured below required no tools. One simply aligns the bottom mounting holes on the SSD to the small pegs on the drive tray. Then, once the drive is seated on those, snap the SATA/ SAS connector side into place. The process takes all of about 8-9 seconds, and I am sure with more experience it could be faster. Compared with screwing in 4 screws, this saves at least a minute per drive. Unlike traditional trayless designs, one gets to take advantage of the benefits that come from having a tray (e.g. no spring loaded drive slots) while making installation take much less times. ExpressCage is great. We did try the cage with mainstream SSD products from Intel, Samsung, SanDisk, Seagate and Toshiba and it worked well. After installing the drives into the trays, the lever on each tray is used to secure the tray into the chassis. With spring loaded “trayless” designs, when these doors/ levers are opened, the drive pops out and loses connection automatically. Having a drive tray solves that issue. A question we often get asked is whether the chassis can support full speeds, or if there is something that drops lower quality SATA signals down to 3.0gbps or 1.5gbps on a 6.0gbps drive. 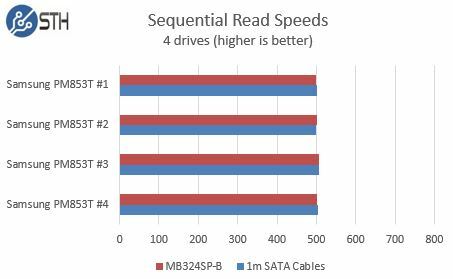 We tested across our four slots simultaneously using four Samsung PM853T 960GB drives. Overall, we can say that the variations in speed seem to be test run variations. 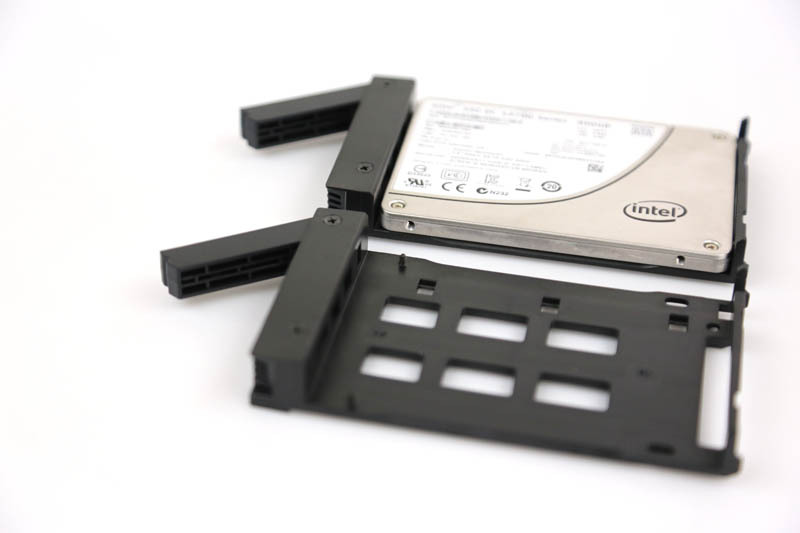 We did also try Intel DC S3700 400GB and DC S3500 800GB drives and saw similar results. Why did it take so long for someone to adopt ExpressCage or a similar technology? That may be a question well outside the scope of this article. The impression this setup has made on a reviewer who has looked at dozens of hot swap bay solutions over the past few years is nothing short of amazing. While I was reserved reading about the feature, getting to try it for myself left me thoroughly impressed. Especially with SSDs where there is less vibration this setup makes a lot of sense. If only Icy Dock made an ExpressCage version for all of these 2.5″ PCIe/ NVMe drives I have sitting around that would be awesome! The one downside is that the ExpressCage trays are plastic which provides the flex required to install drives. Although we generally prefer metal trays, the plastic seems sturdy enough and allowing the quick installation is great. 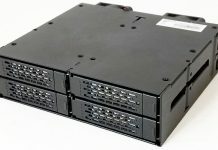 For about $50 this is a great workstation/ SMB server option. What a pity that it doesn’t support 15mm drives. I like the smart fan. Did you test any 12 gigabit SAS3 drives?